The professional IT world has gone way past having virtualization and cloud computing on the "thinking about it" list. Virtualization and the cloud are here. The goals for these new technologies may vary with each IT organization, but as a whole they are clear for all to see: Virtual infrastructure and cloud-based applications must deliver radical flexibility, transcendent efficiency and performance, cost reductions, and quality of service. The advent of the new Microsoft Windows Server 2012 operating system promises breakthroughs on all these fronts, especially when powered by the AMD OpteronT processors. AMD processors complement the innovations introduced in Windows 8 on numerous dimensions, ranging from NIC teaming and memory management to core density and system management. The end result is a combination that allows organizations to cloud optimize their IT. Ultimately, putting Windows Server 2012 to work on a server platform powered by AMD Opteron processors is about making a dynamic data center where you get the power of many servers but the simplicity of one. The many capabilities these two technologies bring to bear are highly complex under the surface but quite simple to manage. 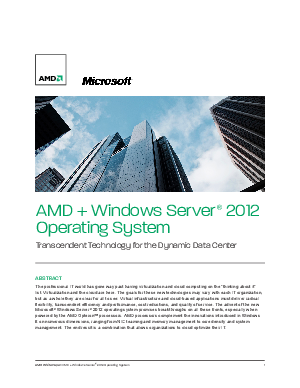 Download this whitepaper to learn more about AMD and Windows server 2012 operating system.